At present online EPF registration for employer became simple and easier, there is no need to submit any document to the PF office. Now entire PF registration for the new company is happening through online. The central government of India has launched the Shram Suvidha portal, where all statutory registrations such as EPF and ESI will be done. Here you can know complete step by step process on how to register a new company in EPF from start to finish in 2019. Any employer who is employing 20 or more than 20 employees should register their establishment in Employee Provident Fund and Miscellaneous Provisions Act 1952. Even employers who are employing at least 10 employees can also register under EPF scheme but it comes under EPF voluntary registration. There is no registration fee for EPF online registration. Yes, PF registration is mandatory for contractors also. Any contractor who is employing 20 or above 20 employees should register their establishment in the employee provident fund scheme. 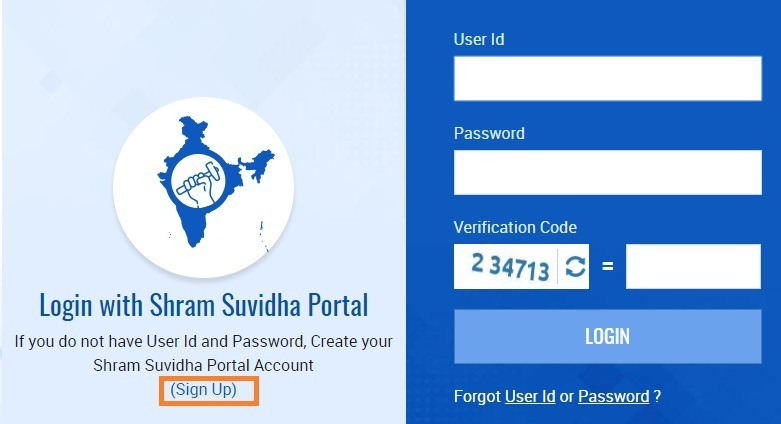 Signup for Shram Suvidha portal and log in with your user id and password. Now in Shram Suvidha portal home page click on EPF registration. Now enter all the required information and upload the documents. Now register your establishment’s digital signature and get your LIN number. 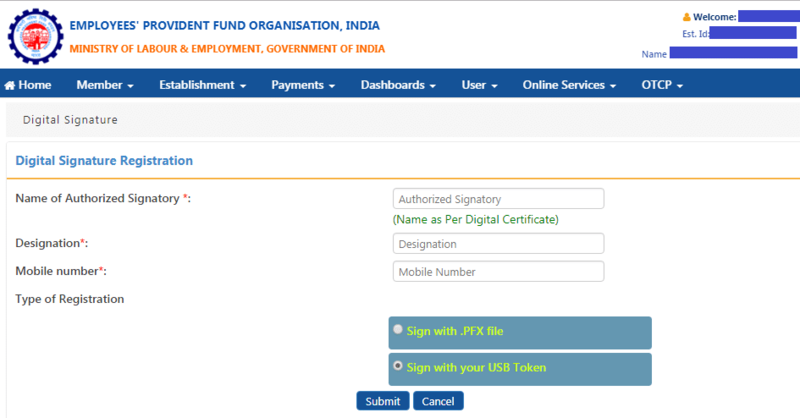 Step:1 Go to epfindia.gov.in website, on the home page of EPFO website you can find an option called establishment registration, now click on that. Step:2 Now you will redirect to Shram Suvidha portal. On the home page of Shram Suvidha portal, you need to signup by giving details like name, email id, and mobile number. 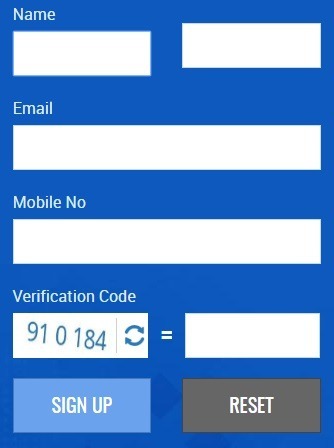 After signup, a verification mail will be sent to your email id. Now open your email inbox and click on the verification link. After clicking on verification link a new page will open there enter the verification code appearing on the screen and click on generate OTP. Now an OTP will be sent to your mobile number, here enter the OTP received to your mobile number. Step:3 Now you need to enter your preferred user ID and password. After clicking on submit you will get a successful registration message on your screen. Now again go to Shram Suvidha portal home page and log in with your user ID and password. Now select which registration you want, you can choose PF registration or ESIC registration or you can choose both. Step:5 Now you need to enter the details of the establishment and upload the required documents. If you don’t know how to fill all these details then download this user manual and read the instructions carefully. Identifier in PF registration means already present license of the establishment. For example, if an establishment already registered under contract labor act then select contract labor act as an identifier. If your license type is not present then select Others and mention the details in the remarks section. After uploading documents you need to register a digital signature. Once you register the digital signature then your registration process will complete and you will receive your LIN. 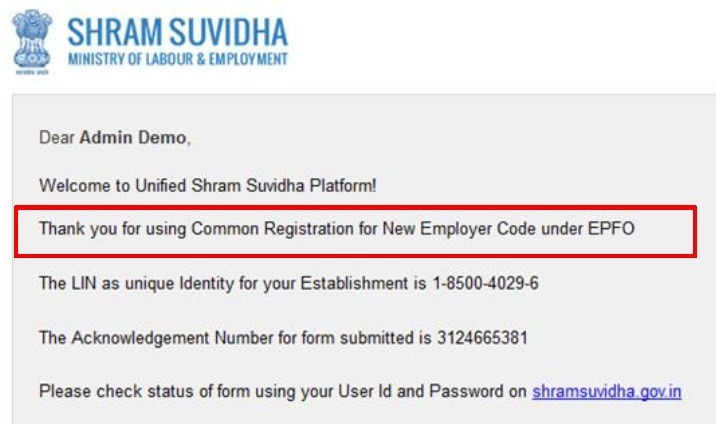 Once you get your LIN number then you can find your establishment details in Shram Suvidha portal dashboard. Conclusion: At present, the entire PF registration for new establishments are happening only in online at Shram Suvidha Portal. If you follow the above steps then you can easily register your establishment in PF. If you still have any questions and problems while registering your organization then share those queries in below comments section. 1) do i have to mention name as per pan card (proprietor) or the firm name which is not same as prorprietor name???? 2) i have sign up and get login id and password and initiated process of registration of pf voluntary ( taken signature on voluntary registration form) but 2 employees are more than 58 year age. ( they were not epf member earlier) now do i consider them as excluded employee or they can contribute to pf portion????? 3) when i get LIN number for the same firm????? I need your suggestion in the case where contractor has been passed away. now, what is the further process to cancel pf code and another formalities?? Await for your positive response. You have to contact your regional PF office to cancel the PF code and they will assist you in further procedures. Had undergone agreement with PSU for one year.. If they get epf no. And esi no. By volunteer establishment registration..
ARE THEY ELIGIBLE FOR EMPLOYER SHARE? Yes they are eligible for employer share. One of contractor working has to be registered under EPF act, for that we have pan card of proprietor name, but his trade name is xyz which is shown on GST certificate, so can we register his pf code under trade name or proprietor name?? You can register under the trade name. But if we go with trade name then portal will ask for pan card in the name of trade? Yes trade PAN is required and also owner PAN number is also required. and need any permission from Labour and other departments ? First, you need to register your firm under your state’s shops and establishment act after that you can apply for EPF and ESI registrations. kinldy guide further how to process. also for your information we have been approving pf claims with that same person signature for whom i have uploded DSC. Take print out of pdf file on your company letter and submit it to PF office. I need your kind help, I have registered one of our Unit for PF coverage through online process. It is successfully registered and code alloted , we have been paying pf also, but thing is Digital signature of our Director which we used at the time of registration is not showing in Digital signature tab of the portal. so what is the issue can you tell me? another issue is , we would like to register second DSC as a authorised signatory for which i have tried to follow procedure in portal for the registration but , at the end when we have to select DSC from following list, i am not able to see any list below from which to select DSC to register. Kindly guide if am going wrong please correct me. i can see the director DSC showing registered . Connect your DSC USB to your system, it will select automatically. Try the process in Mozilla Firefox. Only Internet Explorer is responding but nothing is showing to select at DSC regisrtation page. You can visit your regional PF office along with your digital signature. Their IT department will register it. pls inform me that in orle sheet that link for click here for olre login is not appearing. pls inform us the reason for not geeting that link. we want to register our company. pls its very urgent. pls solve this problem.